Here’s a crochet tutorial I’m very excited to share with you, that I originally wrote for Little Becky Homecky (who’s a fellow crochet and sewing gal!) and now am getting you in on the goodies. 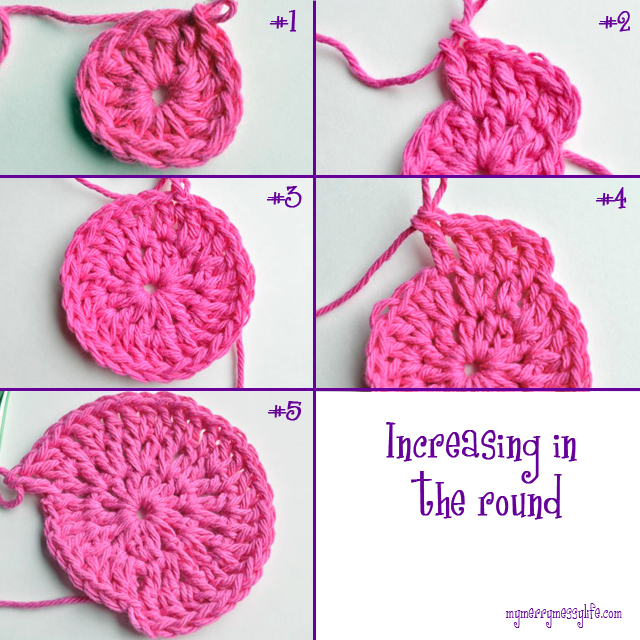 Here is your beginner’s guide to increasing and decreasing in crochet – an essential skill for working in the round to create hats, doilies, bags, amigurumi, and much much more! First, let’s start with increasing. 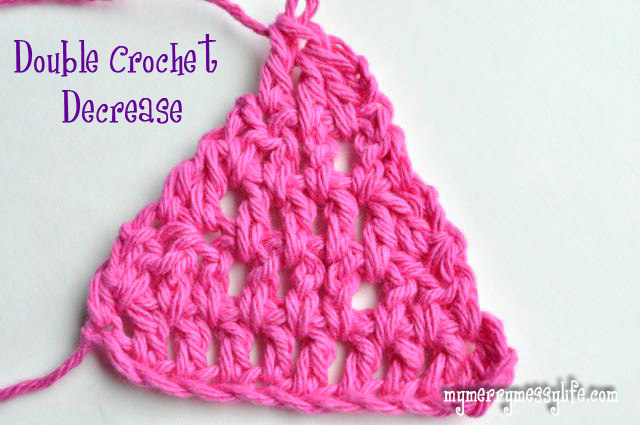 This is a crochet technique that is used to make the width of your project wider. A project is made longer by adding more rows, but it is made wider by adding increasing stitches. An increasing stitch is simply two of the same stitch in one space. So, for example, I have chosen to use working in the round (see my post on that here) as my example for you, because it is one of the most common projects in which there are increasing stitches. Working in the round is one of the most important techniques to master in crochet as you can make hats, flowers, dolls, clothes and more. See my crochet page for lots of hat and flower patterns! Picture #2 – This is an increasing round where we work 2 double crochet stitches into each space. Picture #3 – Shows the completed round 2 which is an increasing round. Picture #4 – This is another increasing round, but different from round 2. 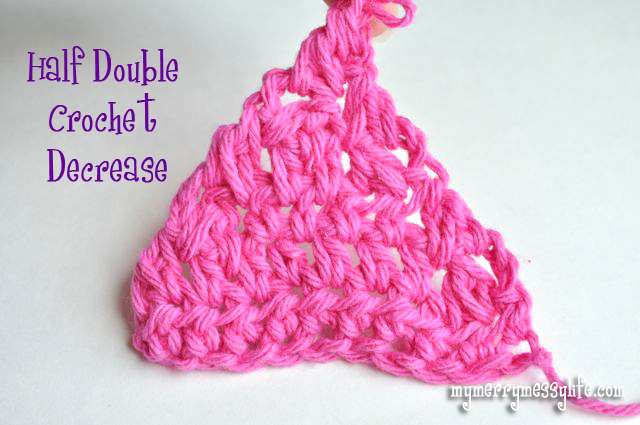 Chain 2, double crochet in the same space (so it looks like 2 double crochets have been worked). 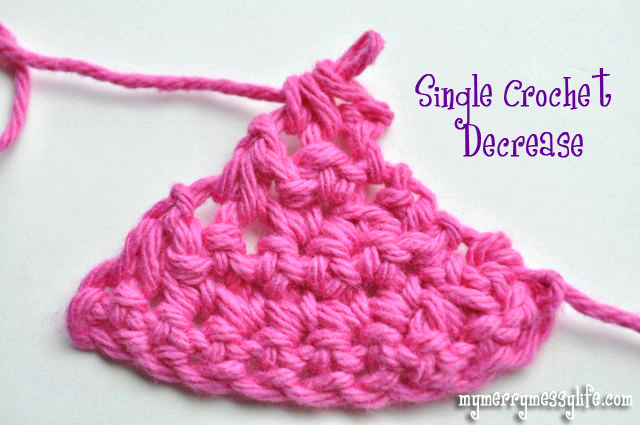 Now work just 1 double crochet in the next stitch. 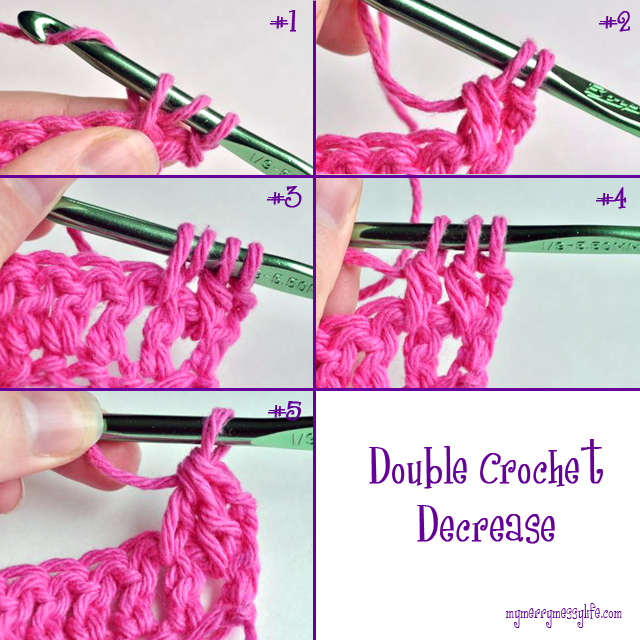 2 double crochets in the next. 1 in the next. Repeat the 2, 1 pattern all the way around. Picture #5 – Shows the almost finished round 3. Now let’s move on to decreasing. Decreasing is important to learn in order to make things like ear flaps on a winter hat and clothing. 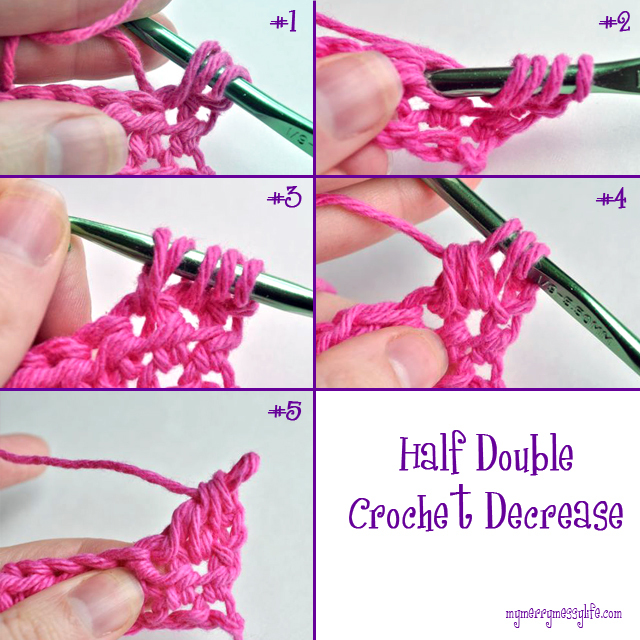 There are different techniques for both single, half double and double crochet, and I have a photo tutorial for each of them for you! In each example, we’re going to make a triangle together. So, come follow along! Photo #1 – Chain 12. 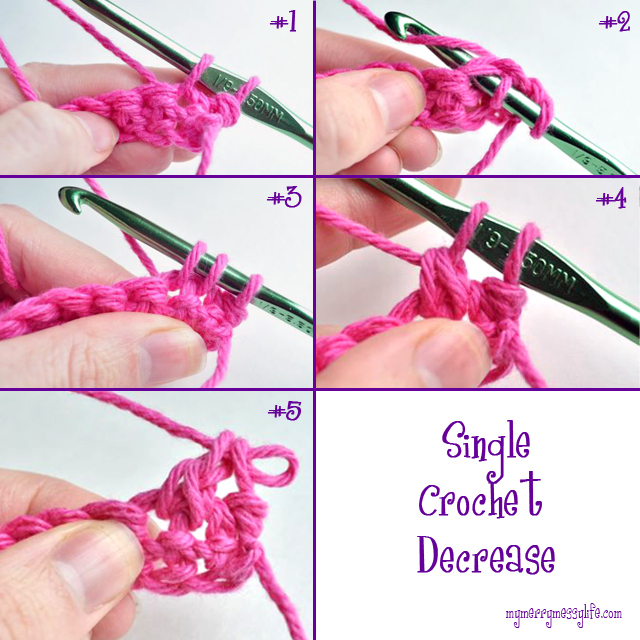 In the 2nd chain from the hook, work a single crochet. Work 1 single crochet in each stitch all the way down. Photos #2 to #3 – Leave the two loops on the hook and insert the hook into the next space and pull up a loop. There are now 3 loops on your hook. Photo #4 – Yarn over, and pull through the first two loops. There are two loops remaining. Photo #5 – Yarn over, and pull through the last two loops. Finished! See how there is only one space now for two stitches? Row 6: Chain 1. Work a decrease in the last 2 stitches to complete! Photo #2 – Leave the 3 loops on the hook, yarn over and insert the hook into the next space. Photo #3 – Now pull up a loop. There are now 5 loops on the hook. Photo #4 – Yarn over, and pull through the first 3 loops. There are 3 loops remaining. Photo #5 – Yarn over, and pull through the last 3 loops. Photo #2 – Yarn over and pull that loop through the 3 loops. There are now two loops remaining. Photo #3 – Yarn over, and insert the hook into the next space and pull up a loop. There are now 4 loops on the hook. Photo #4 – Yarn over, and pull through the first 2 loops. There are 3 loops remaining.